Dwell on Design showed a range of green living design options — from energy-efficient LED lamps to gorgeously green modular homes. 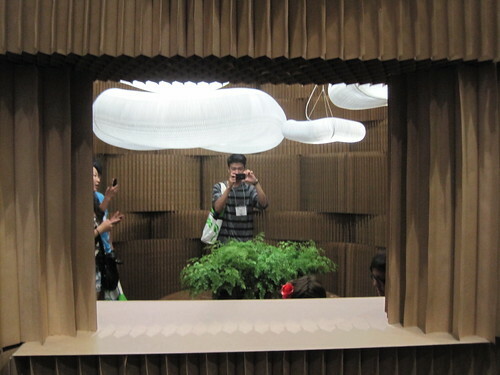 June 27, 2011, 2:50 p.m.
To get a sense of how chic and fabulous a greener lifestyle can look today, you need only attend Dwell on Design. The West Coast's biggest design event took over a chunk of the Los Angeles Convention Center last weekend to showcase the latest in great design — much of it sustainable, green, and enviably beautiful. Case in point: The Ecofabulous MODERN LIVING Showhouse, which tricked out one of pieceHomes' eco-friendly modular houses with gorgeous sustainable furniture, energy-efficient appliances, and other green living accoutrements — down to pretty tableware made from natural and reclaimed materials! If you saw the showhouse and want to live in it, you can actually own it — if you're the highest eBay bidder! The home will be auctioned off, so get your bids in between July 5 and 15 — with the extra bonus being that what you pay for the house will be donated to Global Green USA. Attendees also got to sit on Cisco Homes' sustainable furniture, look at big, all-paper structures from molo, learned about the humanitarian work of Architecture for Humanity, snapped up energy-efficient LED lamps from Koncept, and heard from speakers and panelists about green consumerism, eco-friendly design, sustainable transportation, and many other pressing green topics. Expect to hear more about Dwell on Design in the coming days from MNN's Home blogger Matt Hickman, who hit the show on Friday, when author of "Cradle to Cradle" William McDough gave his keynote!